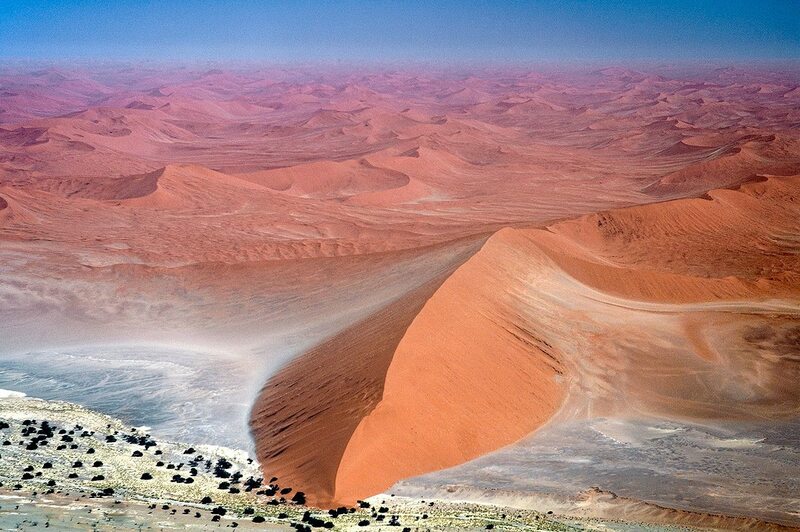 As we soar above the remarkable red sand dunes of Sossusvlei, the arid landscape seems alien, even surreal. 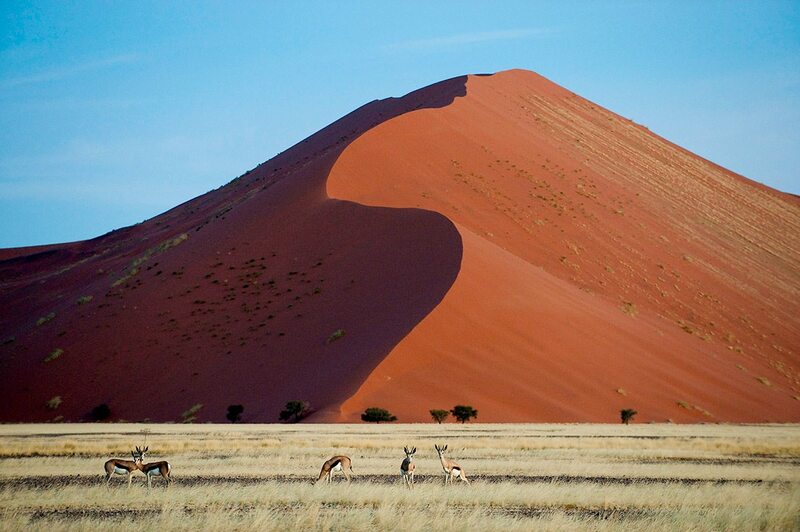 Endless chalk-coloured sands merge into these crimson-red dunes (among the highest in the world), which in turn stretch into the Naukluft mountain range with its vast plateaus and soaring canyons. Drifting silently through the air, we can see the dry Auab riverbed in the distance – part of the private Kulala Wilderness Reserve where Little Kulala is based, flanked by its distinctive camel thorn trees.As we are congratulating ourselves on choosing a hot-air balloon trip to fully appreciate the immensity of the desert, an exclamation from our guide draws our attention to the right – where a herd of elephant marches implacably by. The sight of these gentle giants against this Martian landscape is both startling and awe-inspiring – desert elephant are rarely seen anymore. 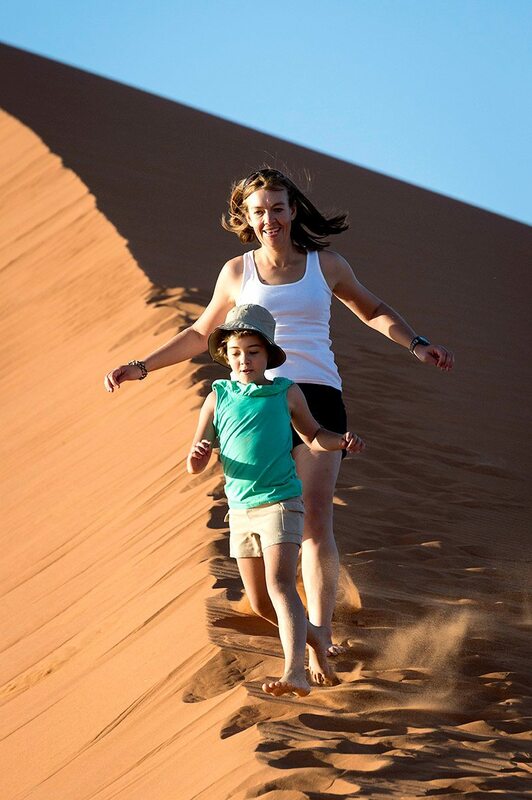 As we soar above the remarkable red sand dunes of Sossusvlei, the arid landscape seems alien, even surreal. Endless chalk-coloured sands merge into these crimson-red dunes (among the highest in the world), which in turn stretch into the Naukluft mountain range with its vast plateaus and soaring canyons. Drifting silently through the air, we can see the dry Auab riverbed in the distance – part of the private Kulala Wilderness Reserve where Little Kulala is based, flanked by its distinctive camel thorn trees. 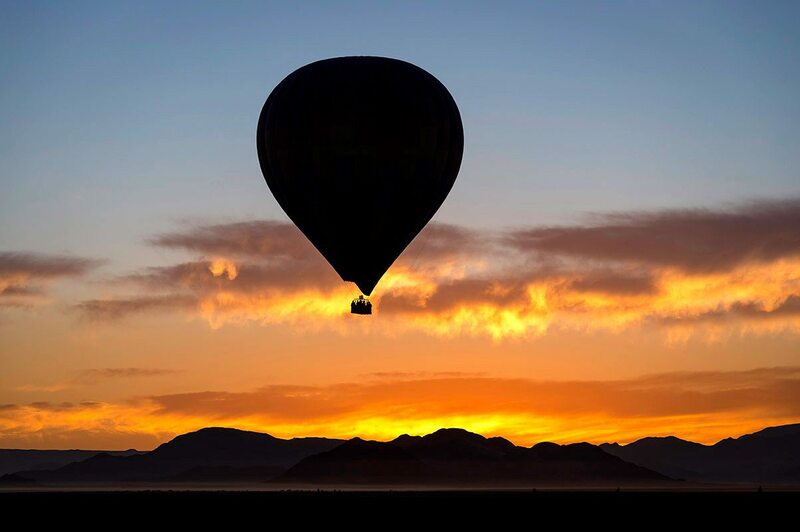 As we are congratulating ourselves on choosing a hot-air balloon trip to fully appreciate the immensity of the desert, an exclamation from our guide draws our attention to the right – where a herd of elephant marches implacably by. The sight of these gentle giants against this Martian landscape is both startling and awe-inspiring – desert elephant are rarely seen anymore. Despite knowing what awaits us back at our luxury Namibian safari lodge, we’re still caught off-guard by Little Kulala’s spectacular beauty. As we walk through the massive front doors we see our first glimpse of the dunes through floor-to-ceiling glass doors, which seem to beckon nature in. The decor is similarly nature-inspired: curved walls are built of white cement and dune sand and thatched roofs are held up by gnarled tree trunks, creating a sensation of soaring space. 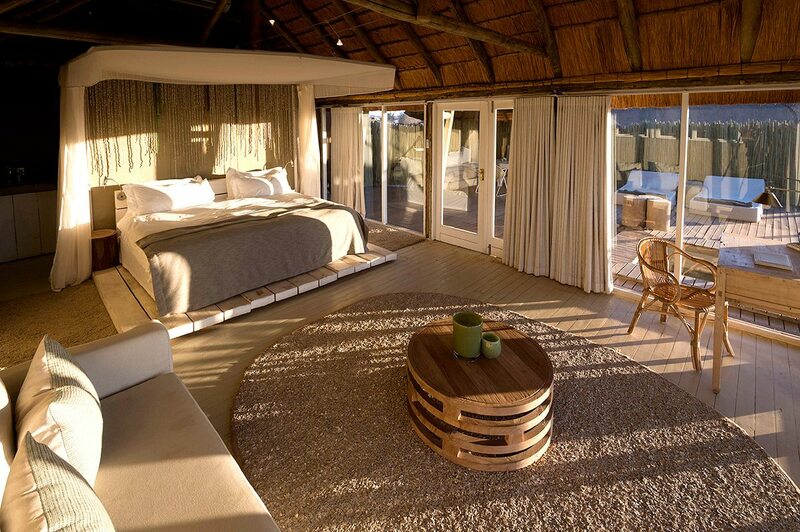 Our suite, or kulala (meaning ‘the place where you rest’ in Oshiwambo), is made of canvas and thatch, and has an expansive bleached wooden deck and private plunge pool. Taking its cue from Sossusvlei’s sun-baked Deadvlei region, muted colours of bleached bone, mud, silver and pale green enhance its cool and airy feel, and pebble-like coffee tables, mohair-covered loungers and curved furniture add to the earthy, organic style.After dinner, when we return again, we’re delighted when we walk upstairs to find our private rooftop platform has been turned into an open bedroom under the stars. We gaze into the very heights of the universe, counting the falling stars and whispering to each other until we drift off to sleep. Despite knowing what awaits us back at our luxury Namibian safari lodge, we’re still caught off-guard by Little Kulala’s spectacular beauty. As we walk through the massive front doors we see our first glimpse of the dunes through floor-to-ceiling glass doors, which seem to beckon nature in. 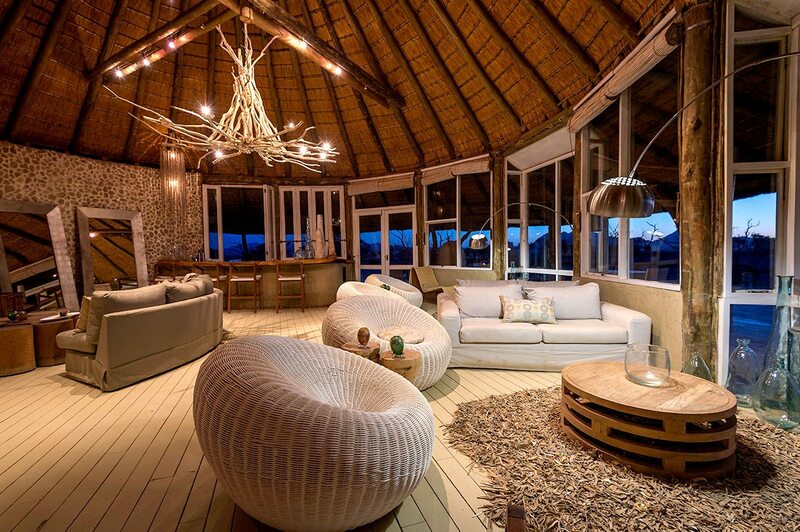 The decor is similarly nature-inspired: curved walls are built of white cement and dune sand and thatched roofs are held up by gnarled tree trunks, creating a sensation of soaring space. Our suite, or kulala (meaning ‘the place where you rest’ in Oshiwambo), is made of canvas and thatch, and has an expansive bleached wooden deck and private plunge pool. Taking its cue from Sossusvlei’s sun-baked Deadvlei region, muted colours of bleached bone, mud, silver and pale green enhance its cool and airy feel, and pebble-like coffee tables, mohair-covered loungers and curved furniture add to the earthy, organic style. After dinner, when we return again, we’re delighted when we walk upstairs to find our private rooftop platform has been turned into an open bedroom under the stars. We gaze into the very heights of the universe, counting the falling stars and whispering to each other until we drift off to sleep. 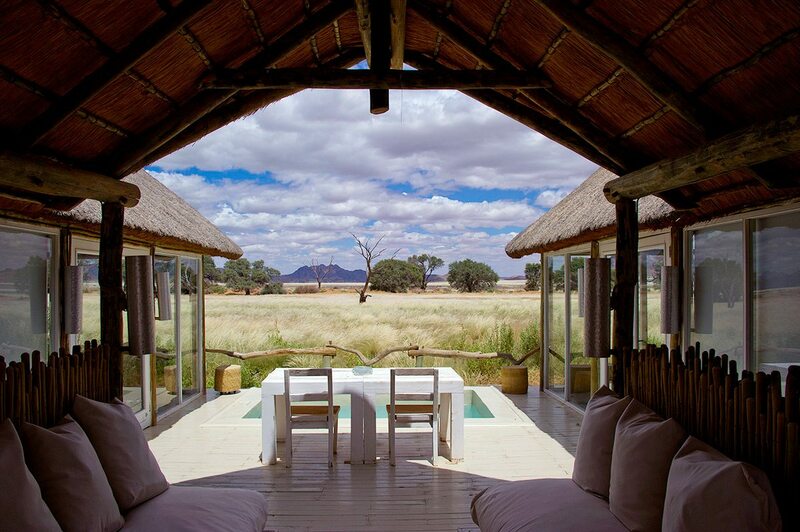 Little Kulala is the closest luxury Namibian safari lodge to the dunes – and it allows exclusive access to Sossusvlei via a private gate. This meant we had all the privacy and seclusion we needed, and opportunities to socialise too.Falling asleep under the stars in our star bed was an incredible experience, as was watching the sun paint the dunes a dusty pastel or fiery red. As was our helicopter ride and trip to Deadvlei, where deadened camel thorn trees were rooted in white clay contrast with the rusty-red dunes.The lodge is deeply invested in the environment and the people of Namibia. We love that this eco-consciousness influenced the design – fabrics are coloured using natural dyes, glass vases are recycled, shelves, furniture and light fittings (including a twig chandelier) are made from alien plant species and there are chairs made from recycled plastic. Our parting gift – a metal water flask – was a nice touch and, true to type, eco-inspired. 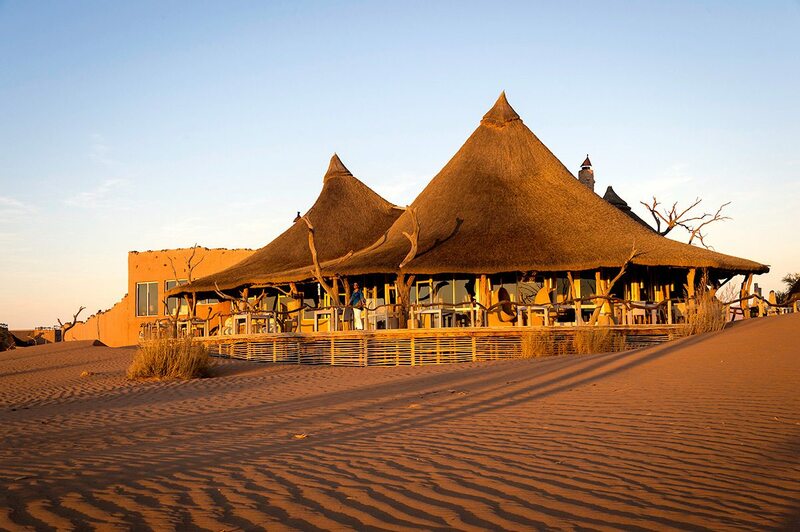 Little Kulala is the closest luxury Namibian safari lodge to the dunes – and it allows exclusive access to Sossusvlei via a private gate. This meant we had all the privacy and seclusion we needed, and opportunities to socialise too. Falling asleep under the stars in our star bed was an incredible experience, as was watching the sun paint the dunes a dusty pastel or fiery red. 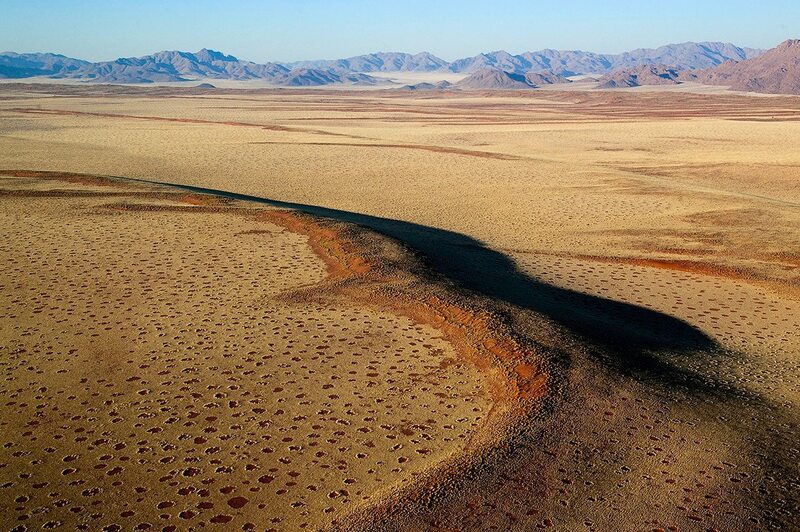 As was our helicopter ride and trip to Deadvlei, where deadened camel thorn trees were rooted in white clay contrast with the rusty-red dunes. 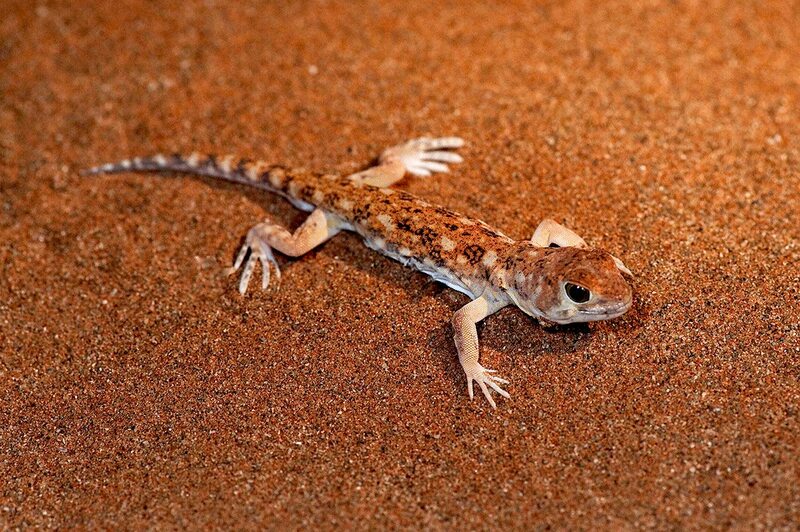 The lodge is deeply invested in the environment and the people of Namibia. We love that this eco-consciousness influenced the design – fabrics are coloured using natural dyes, glass vases are recycled, shelves, furniture and light fittings (including a twig chandelier) are made from alien plant species and there are chairs made from recycled plastic. Our parting gift – a metal water flask – was a nice touch and, true to type, eco-inspired. 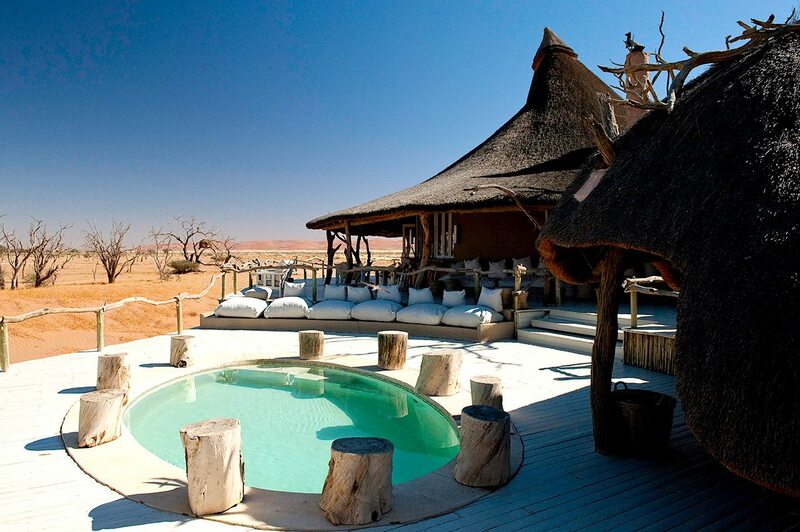 Small desert camp – just 11 suites with private plunge pools, including one family suite – overlooking a waterhole in the Sossusvlei region of Namibia. 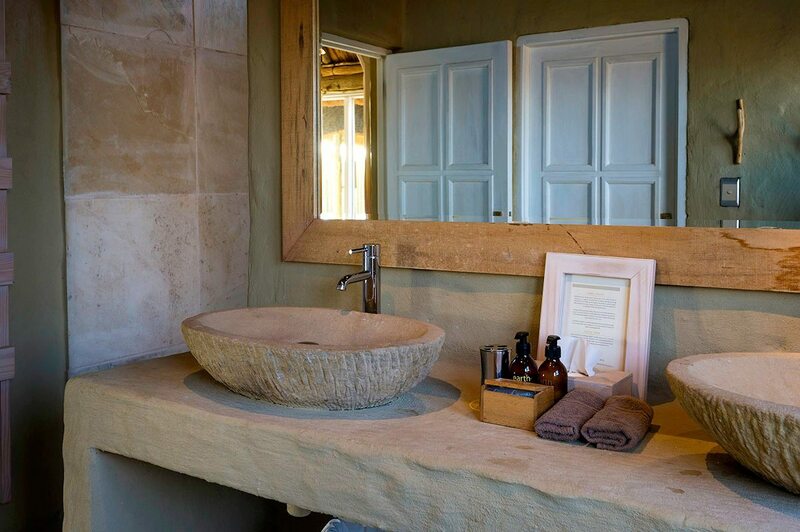 The lodge has a well-stocked library, restaurant, wine cellar and craft boutique. 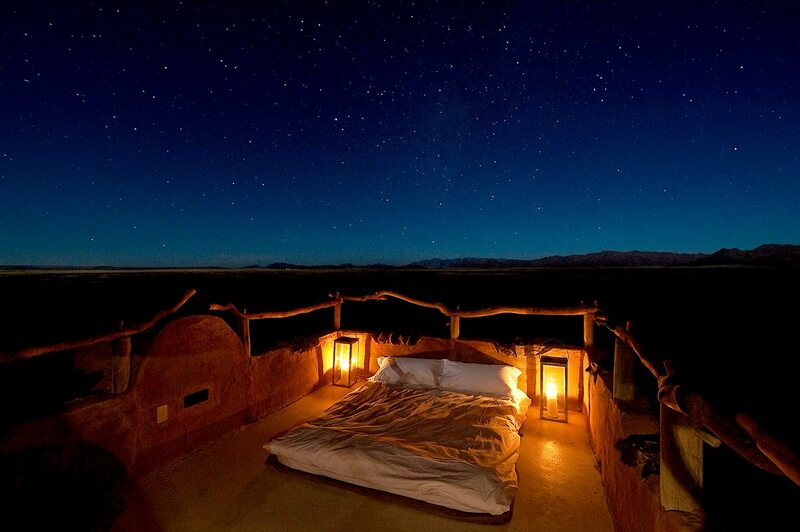 Private reserve, private access to Sossusvlei, individual dining and star beds. 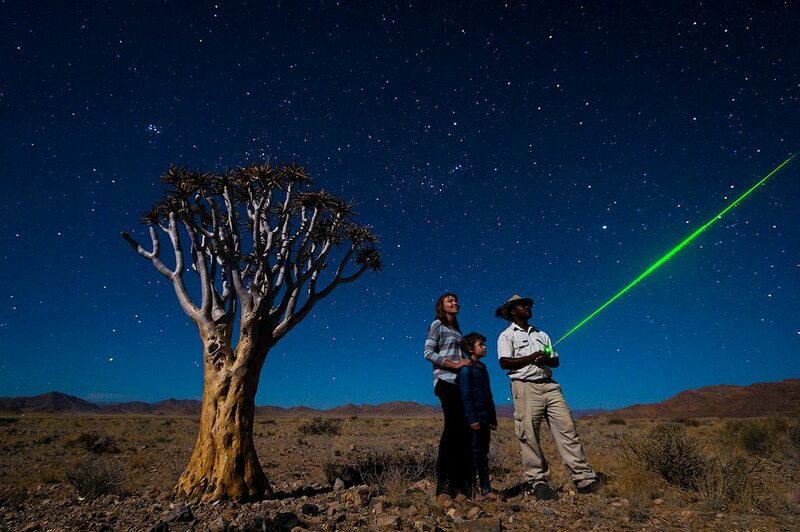 Game drives, walking safaris, horseriding (additional cost), sundowners, stargazing, quad biking, spa treatments (additional cost), swimming, sleep-out deck, waterhole and wildlife hide, Sossusvlei and Sesriem excursions and hot-air ballooning (additional cost). Children from six years are welcome, but age (and height) restrictions apply for certain activities. Triples can be accommodated, and there is one family kulala. Children’s programme available. 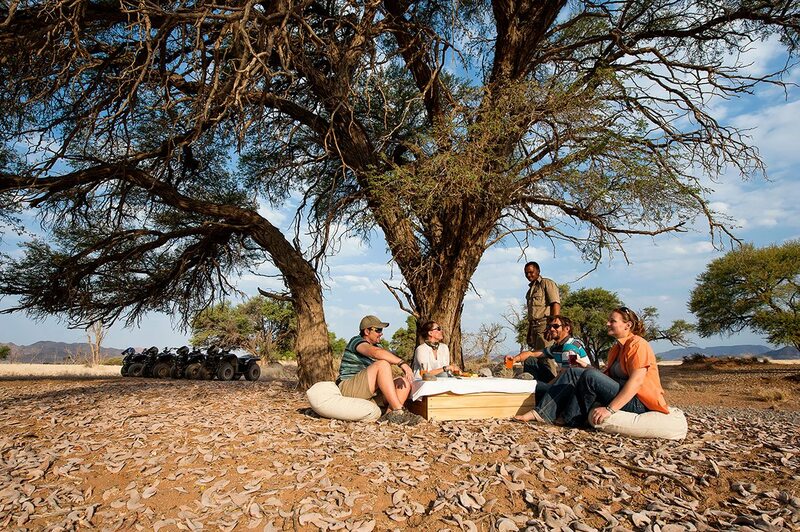 Not only do African safari lodge prices shift with the seasons, they also change based on your length of stay, room type, travel party composition, special offers, if your trip involves stays at sister lodges – and for more reasons besides. It’s worth noting that depending on your itinerary, your lodge cost will make up about 75–85% of your total safari trip cost. Our safaris are tailor-made to match your personal safari dream, we’d be delighted if you’d allow us to create a bespoke proposal for you. Simply enquire now – our quotes are complimentary and obligation-free. However, to help you get an idea of safari lodge prices we’ve created three safari-lodge categories with various price ranges, to find out more click here. 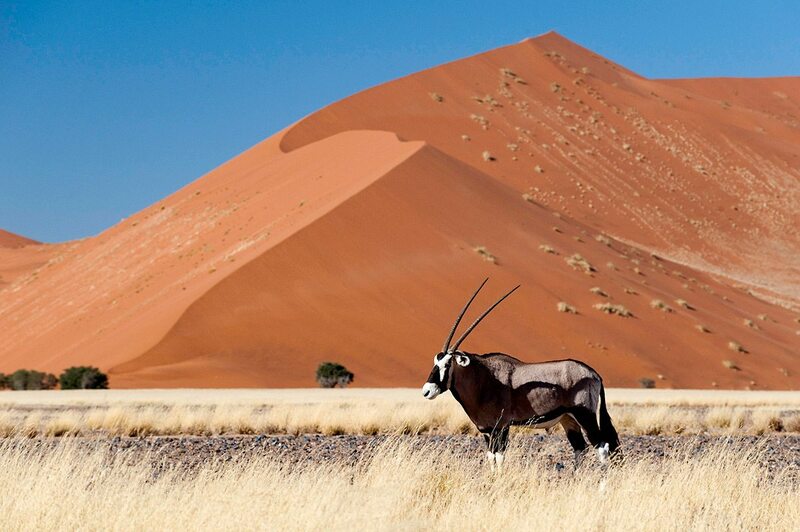 Namibia’s cooler and drier winter season is definitely the best time to visit Sossusvlei. Crisp clear mornings and evenings are preferred for getting active, especially if you’re keen to hike up some of the towering dunes. Early starts are also recommended for the best photographic opportunities, with cloudless skies ensuring that the saturated colours of the sand formations are at their most intense. The complete lack of rainfall in this winter season means that you’ll experience nothing but the stark, undiluted beauty of Sossusvlei. 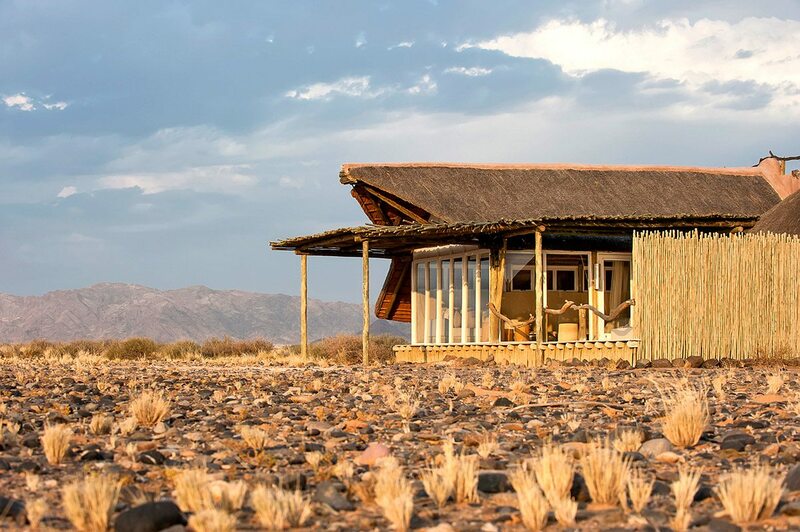 A luxury Sossusvlei safari is also very possible in the hot summer, with luxury lodges having many tactics for making the heat manageable. 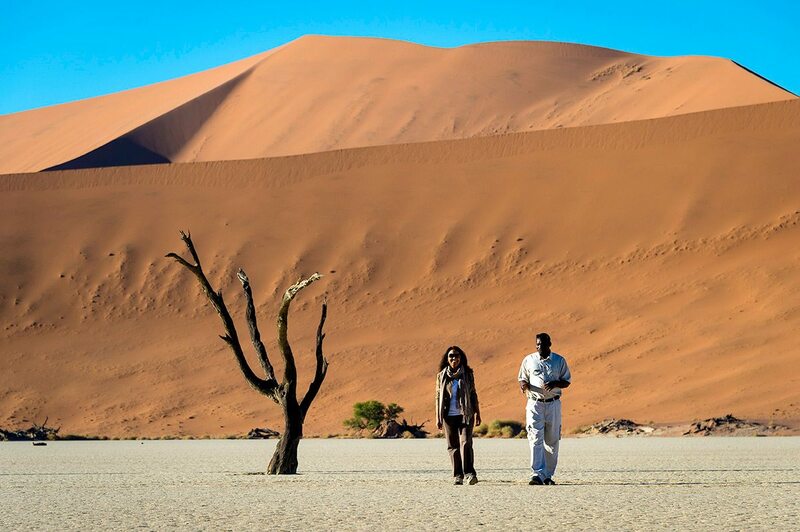 This time of year tends to be less busy, so you’ll have an even more enhanced sense of solitude as you explore Sossusvlei and the surrounding areas. 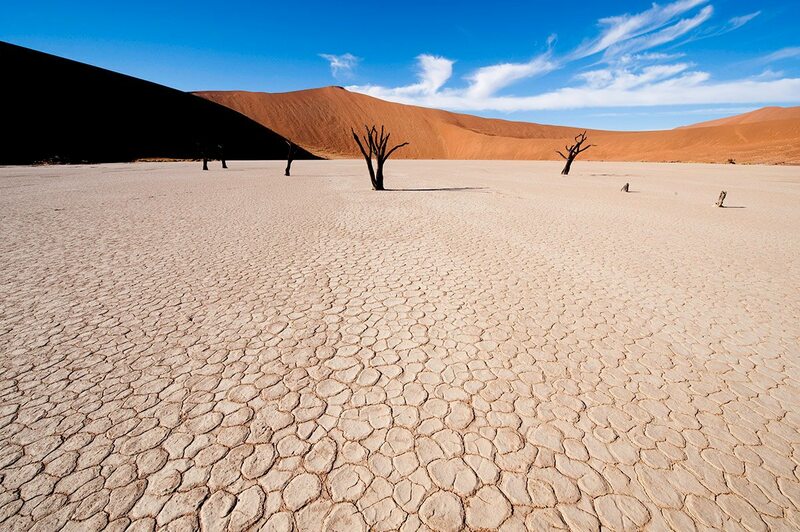 It also means that you could be one of very few people ever to have witnessed the near-miraculous transformation of Sossusvlei after a summer rainstorm. 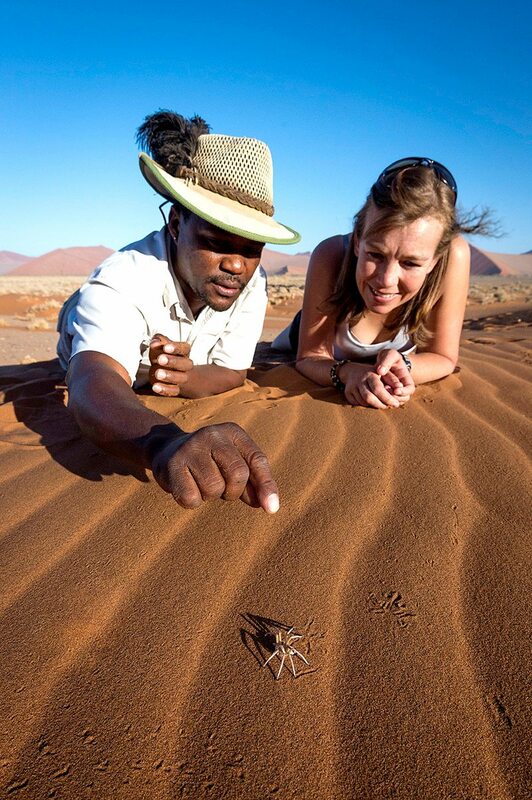 Cooler year-round conditions at Skeleton Coast offer the possibility of a combined itinerary.